Classical Net Review - Musical Mysteries VII - Rondo Rarities! Rondo was a record label from early in the stereophonic era. Apparently, it was designed to appeal to consumers with little cash, but who were eager to hear classical music recorded via the new technique. When performers were credited at all, they were given vaguely impressive pseudonyms – French ones for French music, German ones for German music, and so on. Rondo did not actually record these performances, but licensed them from a Hamburg-based operation run by someone named Paul Lazare. Lazare had many clients like Rondo, and so a single recording could appear on several different budget labels, each one attributed to a different performer. For example, the "New World" Symphony presented here was variously conducted by "Alfred von Weth" (Rondo), "Amleto Toscali" (Design), and "Cyril Holloway" (another Design release). These versions would differ slightly, depending on what takes and edits Lazare used. This fascinating ReDiscovery reissue is a collection of recordings that at one time appeared on Rondo, now painstakingly remastered by David Gideon, and researched so as to reveal the names of the true performers. (These are given above.) No one will argue that these are the finest recordings available, but that is not the point. The point is that some pretty good music-making hid in the bargain bins during the 1950s, and that the men and women who were behind it deserve to be given credit. Furthermore, the performances have a spontaneity sometimes missing from more polished releases. The Brandenburg Concerto is conducted by Harry Newstone, a Canadian-born conductor who worked with, among other musicians, pianist Artur Balsam in recordings for the Concert Hall label. The only thing wrong with this performance – it is very well played – is that a détaché style of playing is so emphasized that Bach almost ends up sounding more like Couperin. Beethoven's Coriolan, once attributed to van Weth and the "Berlin Symphony," is given a hell-for-leather performance by the now very much forgotten Erich Riede, conducting Lazare's Hamburg-based musicians. It's not polished, by any stretch of the imagination, but it's vital, and true to the music's revolutionary spirit. Rondo also gave credit to "Alfred van Weth and the Berlin Symphony" for the Dvořák and the Brahms. Even though the former, sometimes scrappily played, shows several signs of being a product of Lazare's casual attitude to recording and editing, one's time is not wasted by this reading, which packs plenty of drama, and is affectionate. One endearing example of Rondo's/Lazare's lackadaisical editing occurs 1:11 into the first movement, where a (very) early string entry is retained. Even better, near the end of the Largo, "van Weth"/Walther stops and restarts a section again. The Rondo release retained the false start, and it has been included on this CD as a bonus track. (In Gideon's edit, the movement proceeds to its end without the mishap.) The Brahms is given a very passable performance by a distinguished Danish orchestra and conductor, although sometimes it runs low on energy. The Nutcracker Suite was attributed to "Elliot Everett and his Concert Orchestra," but again, this is Walther. Here, the stereo soundstage has been exaggerated, and the percussion have been goosed up a notch, presumably to gratify the would-be audiophiles. (The tambourine in the Arabian Dance sounds like chains dragging across the floor.) This is probably the least refined Nutcracker I've ever heard, but if I said it didn't give me a wry sort of pleasure, I would be lying! This set comes to end with a ridiculous suite from La Périchole, although it includes music from other works by Offenbach, including the famous Barcarolle (turned into a vaguely South American confection in this version) and the inescapable can-can. The arrangement is gauche, silly, and guaranteed to raise at least a few snickers. "Suzanne Auber" and "The French Orchestra" (Walther again) did themselves proud. ReDiscovery reproduces Rondo's original cover art. On the front cover, four maidens smilingly repose on the beach, each clad in a one-piece bathing suite. (Cheesecake alert!) On the back, we see the same maidens, but photographed from the rear. To emphasize the "behind the looking glass" effect, even the lettering has been reversed on the back cover. Trippy! What were they putting in the water in the 1950s? The source for this reissue was (for the most part) the old Rondo LPs themselves. As they were not pressed on high-quality vinyl to begin with, Gideon had his work cut out for him, but he has done a remarkable job of making the music in these grooves come alive, so patches of surface noise and distortion are easily shrugged off. This pair of CD-Rs is available for just $15, and that includes shipping and handling. As with earlier "Musical Mysteries" reissues, the booklet notes are more complete than is often the case with ReDiscovery (www.rediscovery.us). They retell the Rondo story (such as it is! 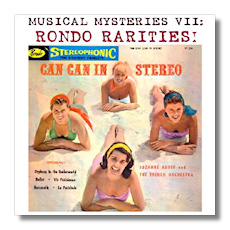 ), and there even are small reproductions of the original Rondo covers.